2. A deal to allow the Raiders to play at the Oakland Coliseum is all but wrapped up, says the NFL Network’s Ian Rapaport. 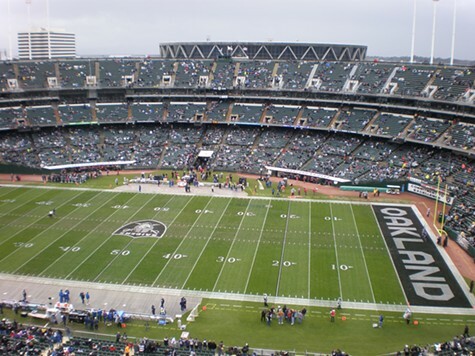 According to the report, the Raiders and the Coliseum Joint Powers Authority have agreed in principle to a lease agreement to be finalized possibly by this Wednesday and ready for a vote by JPA on Friday or next week. 3. The proposed clustering of cannabis dispensaries in one particular area of a city is becoming a hot-button issue in several East Bay communities. Berkeley could have three dispensaries within a six-block area of Telegraph Avenue near U.C. Berkeley, Berkeleyside reports. Recently, Alameda and Hayward have or will be tackling variations of the same issue, as they begin their own nascent cannabis industries. 4. Are Democrats in Sacramento aiming too high this year when it comes to proposed tax legislation? The Sacramento Bee’s Andrew Sheeler lists all the proposed tax bills including a oil excise tax proposed by East Bay state Sen. Bob Wieckowski. Take note: A tampon tax bill — albeit tax exemption —proposed again in the Assembly is set to be endorsed next week by the Alameda City Council next week. 5. East Bay Rep. Eric Swalwell’s interest for running for president is well-known. But his speech last weekend in New Hampshire, site of the country’s first primary, is his most policy-oriented yet. In the speech, reports WMUR, a New Hampshire television station, Swalwell said, “Go big. Be bold. Do good, while advocating for universal health care, elimination of the federal college loan rate, and allowing college graduates to refinance their school loans.